Summer 2012. | thoughts, life and food. Great to see that Cat-On-Head Man came through the storm with cat still firmly on head. oh heyy i saw him over the summer! eating, biking and then some more eating. on my way back from china, i got to stop in san francisco to hang out with my sister for a couple of days! there must be some type of “planning” gene that runs in our family because all of us sure do love to make sure things are planned out. days before i was even set to leave from china, my sister sent out a full-packed itinerary for the days that i was going to be there, most of which included where we would be going to eat our meals. i was super excited!! 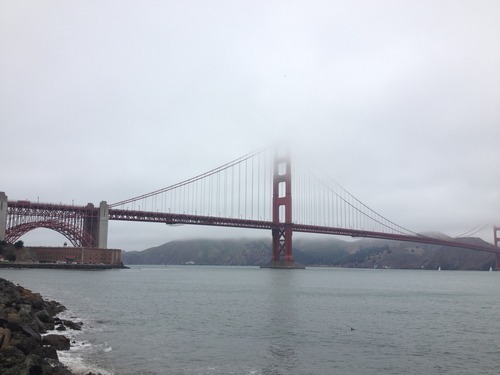 the next day was a bike ride over the golden gate to sausalito! it was a pretty long bike ride that included three hills but still really nice! 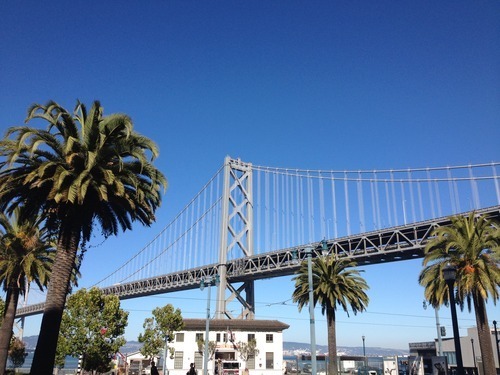 san francisco is SO COLD during the summer- who wears jeans and fleeces in the summer?! ?- so the bike ride was extremely windy but it was cool to bike across the bridge! 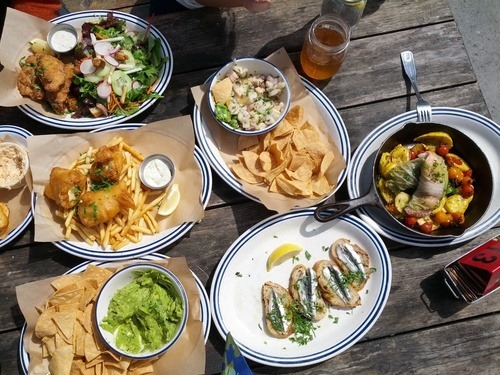 main reason for the bike ride all the way to sausalito was to go to a delicious seafood restaurant named fish. i was so excited (and hungry!) when we finally made it. there were five of us so we were able to order a bunch of different stuff to all try! EVERYTHING WAS SO AWESOME but my favorite would probably have to be the fried oysters or clam dip. yummm. 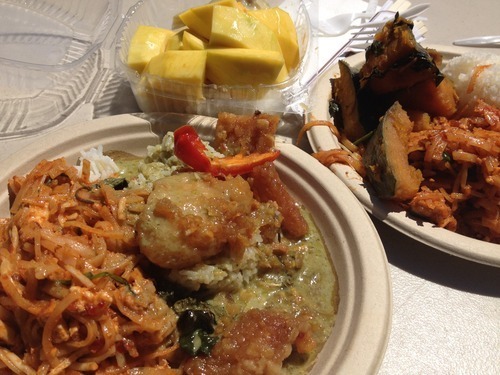 as if i hadn’t already eaten my fair share of food in california, the next day, my sister and i went with another one of her friends to berkeley to try food at wat mongkolratanaram, which was a thai temple. 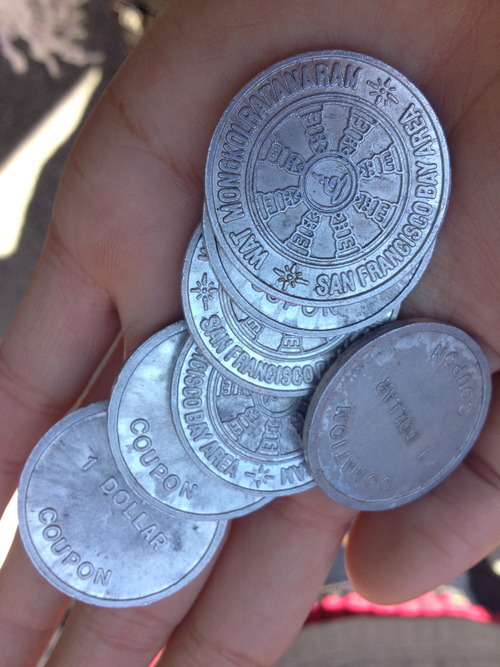 instead of paying for the food with cash, we had to first exchange our cash for these tokens that we then used to pay. it was an interesting concept and the food was not bad. we got there a bit late so they had run out of most choices but i thought the pad thai was good! 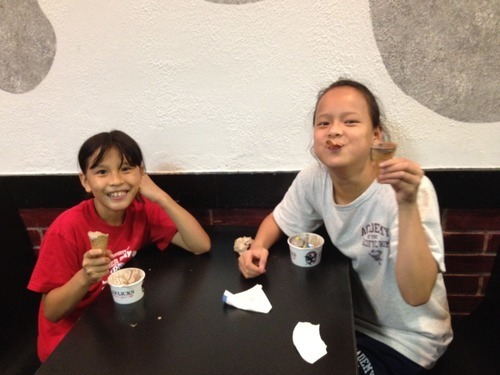 next was an ice cream near the uc berkeley campus called CREAM (cookies rule everything around me). we got to pick two cookies and an ice cream flavor which was to be put together into a ice cream sandwich! this place was much cheaper than a lot of ice cream sandwich places were in new york so i was extra excited! 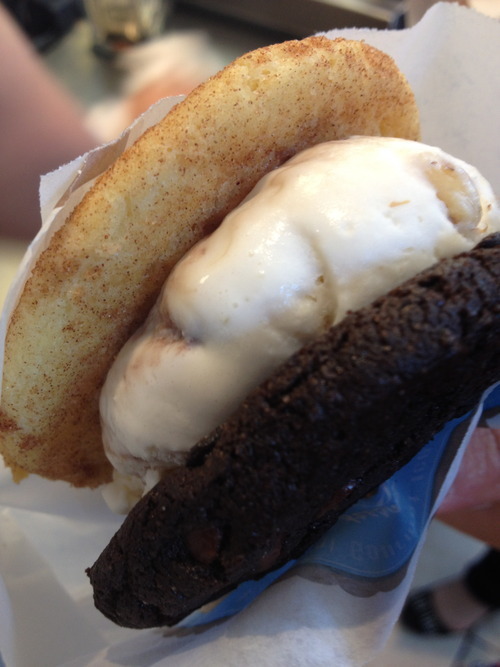 we got snickerdoodle and double chocolate chip with banana fudge walnut ice cream in between. YUMMMM. and the cookies were soft and warm too! 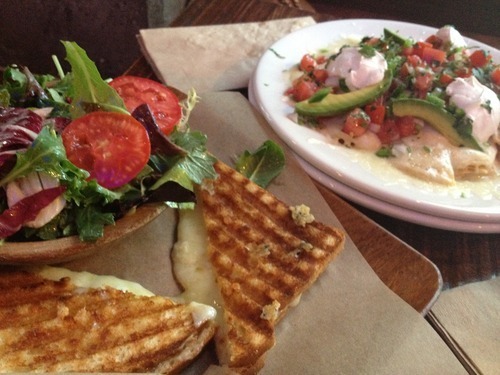 dinner was simple at a local place called the grove but the grilled cheese there was really good! as were the nachos. monday was relatively less eventful since my sister had to work so i hung out with some friends of mine who were in the san francisco area. we met up at the ferry building (which is really similar to something like quincy market in boston) and at a mexican place called mijita. nothing spectacular but it was fun to catch up with old friends. 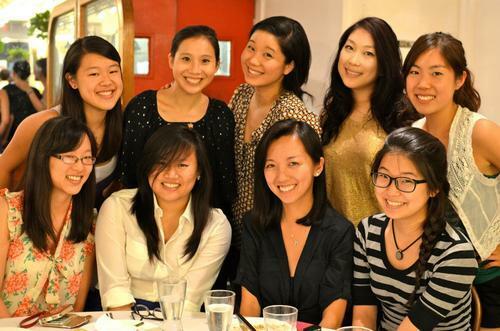 (: met up with some harvard people afterwards and went to chinatown for egg tarts and then met up with my sister and some of her friends for sushi dinner at akiko’s nd pinkberry! a perfect way to end a trip to san francisco! although i will still continue to complain about the weather since 60s is not “summer”. and now, back at harvard getting ready to start my junior year. i can’t believe i’m going to be a JUNIOR already. it’s kind of crazy to think that i’m already halfway done with college and i now have to really start thinking about real people things and life after college. crazy crazy. but for now, back to choosing classes for the upcoming semester! the last days of beijing. the end of hsylc came with the end of the house games, a “fashion” (aka dance show), talent show and delicious final meals in china. 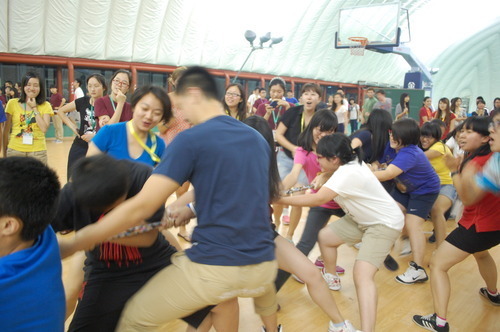 after the epic tug of war matches that took place, we had a “wacky relay race” for the second night of house games. while my house (WOOHOO DIGNITAS) didn’t win, it was entertaining to watch everybody speed-walk race among other things. the next night of house games was a fashion show that became less of a fashion show and more of a dance-off. every house went on-stage (wearing different outfits) and did some type of choreographed routine to music. the other seminar leaders and TAs from my house only went on stage at the very end of our act, but the kids all had a great time! 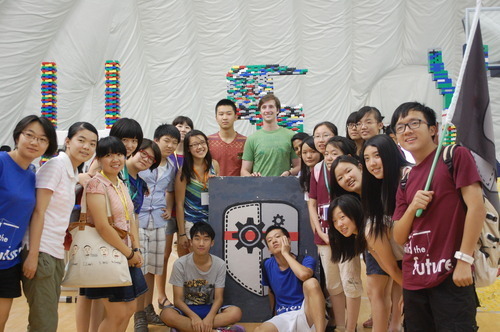 on the final day, the students took part in “mission 300.” mission 300 is when the students had to split up into seven groups and form the letters HSYLC-BJ using only lego pieces. the talent show on that final day included 38 acts ranging from singing to dancing to magic tricks to a “variety show”. at the end of it, the seminar leaders performed a piece to a medley of lion king songs although it was much more fun to see all the amazing talents of the kids! it was sad to see hsylc end and see all the kids go back home to get ready to start school again. i remember all those times i went to summer camp during high school and meeting people who to this day are still some of closest friends. i hope that for the students, hyslc was something that they not only were able to learn from but also had a great time meeting new friends! the end of hyslc and a couple more days until i was going to head back to the states meant free days for city exploration and eating! 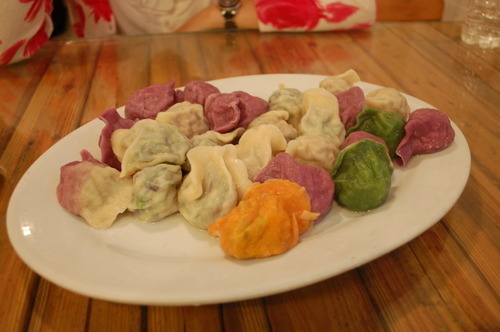 on one of the first free days, my roommate and i ventured to find a dumplings place that was supposed to have a bunch of interesting dumplings fillings. to our surprise, we found it pretty easily and were happily surprised by all the interesting dumplings they had. we ordered four different types: 1) shan yao (chinese yam), chinese broccoli, wood ear, 2) hot pepper, minced peanut, minced pork, 3) minced pork, xiang gu (chinese mushroom), 4) purple cabbage, bean sprout, guo ba (rice crust), minced pork. my favorite one would probably be the one with purple cabbage and rice crust. such an random combination that was actually so good! who knew that rice crust would make for a delicious dumpling filling? 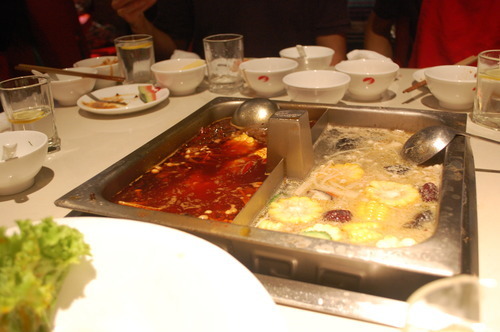 that night, i went with a couple of the other seminar leaders, staff and TAs/AAs to a hot pot restaurant in beijing known for their service. chinese has never really been known for the quality of their service at restaurants but at this place, not only do they offer free snacks as appetizers, they also gave you aprons while you eat, free eye glasses wipes and PAINT YOUR NAILS WHILE YOU WAIT. it was insane AND the food was good! such a win-win. needless to say, i was overly full by the end of the day. and on the final night, we ate at a place famous for their southern chinese food. the wait is usually incredibly long but we somehow managed to get a big room since there were so many of us. i have always LOVED southern chinese food and this place was amazing. i’m glad there were a bunch of us eating together so we got to try a bunch of different dishes. as always, my favorite was chao nian gao (fried rice cakes). yumm. they also had these peking roast duck bao zi which were equally as delicious!! last adventure of my summer to go: a jam packed four days spent in san francisco with my sister! 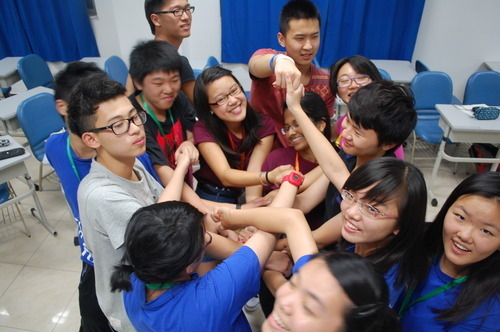 the end of beijing was great and i’m so glad i got to be a part of hsylc! would upload a blog post but i just realized that i put my camera with all the pictures in my checked luggage… ): blog post and facebook pictures to come! 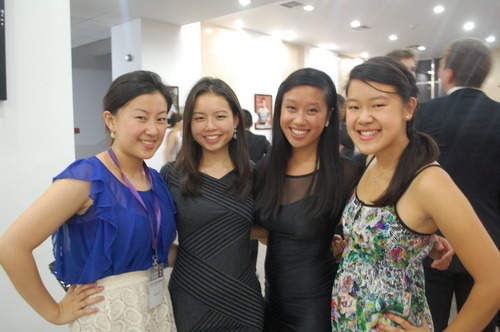 after staying in shanghai for a couple of days, i made my way to beijing for hsylc! 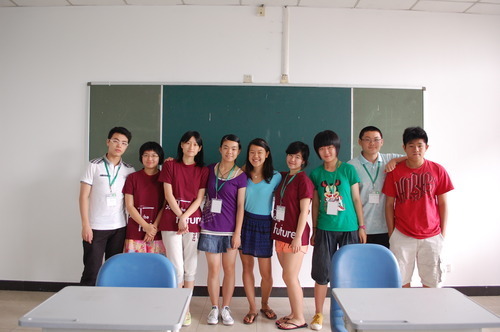 hsylc is an eight day conference for chinese high school students to participate in where a bunch of harvard students come to teach seminars to them. it’s basically like a summer camp for them and we teach classes, hold extracurricular activities, and are sorted into houses. the seminar that i’ve been teaching is about the evolutionary track of humans and looking at similarities/differences between humans and some of our closest ancestors. we teach three 1.5 hour seminar classes to a total of four different groups of students. this means that we have to teach the same class FOUR TIMES. i did not realize how hard it is to be a teacher!! it gets so tiring. but overall, the kids are amazing. the kids who get to attend hsylc are some of the top students at their high schools and there are also some kids who are here who go to private schools in the US or Europe. the kids work incredibly hard and have so many interesting perspectives to offer during the seminar classes. and after having conversations with these students, i am continually impressed by their english and their ideas. today was about the half way point of hsylc so i had my last classes! these pictures are my students from seminar A and seminar B. since it’s a class about primates/humans, i told some of them to pretend to be monkeys! 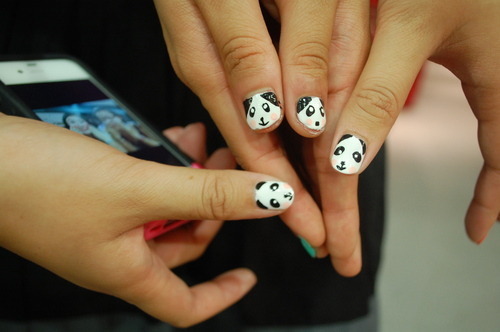 they were a litle hesitant at first but i’m glad they all agreed to my crazy photo taking ways. 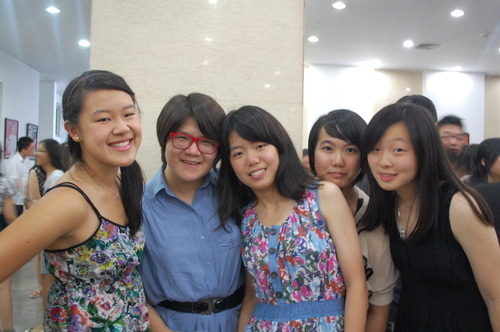 (: i’m excited to meet another two groups of students in the following days! outside of classes, i’ve been running the “crafts” extracurricular activity. students get to choose from a variety of extracurricular activities that the other harvard seminar leaders and i are helping to run. at arts & crafts, i have been teaching them how to make friendship bracelets. 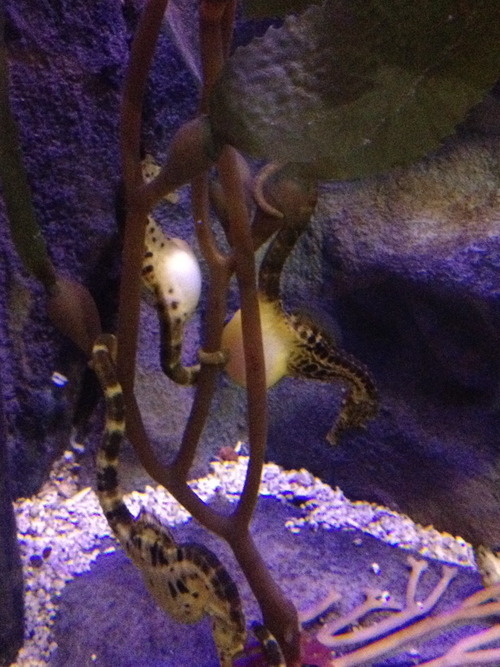 unsurprisingly, usually only girls come but today, there were two boys! it was funny to watch them work so diligently on their bracelets and their bracelets turned out really good! the hsylc students are sorted into 12 different houses and i’m in charge of DIGNITAS house with two other seminar leaders. 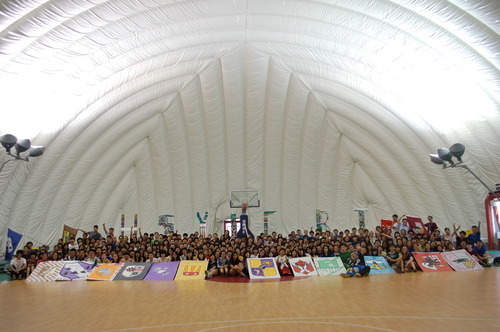 we did some bonding activities with them to generate house spirit! we played a bunch of different games including the human knot although that quickly ended because our knot was somehow actually IMPOSSIBLE to untangle and all that body heat was getting incredibly hot. we did, however, come up with one of the best house cheers that the students learned: “dignitas, applesauce, both of them are good. we’re the classiest around, don’t mess with our hood.” BE JEALOUS. kind of like harry potter, each house can gain/lose points that will ultimately culminate to the awarding of a “house cup.” today we had our first house games which was a tug of war tournament. unfortunately, dignitas was eliminated in the first round which was sad but at least we gave it our best effort! then, all of the seminar leaders played against all of our teaching assistants (chinese college students who help us with our seminars!) and we LOST. sad. tug of war is a lot harder than i remember it being! still five more days here at hsylc! so far, i have been having a great time and can’t wait to teach another two groups of students. i hope these kids are getting a great experience out of this program and at the same time, i have learned a lot from them. i am grateful for the experience to be teaching these students and love their willingness to work hard and ask really interesting questions to show that they’re really thinking. woohoo for more hsylc adventures! yesterday for dinner, i accidentally ate some pigeon. my uncle, aunt and cousin took me out for dinner and when one of the dishes came out, the meat resembled a small bird. 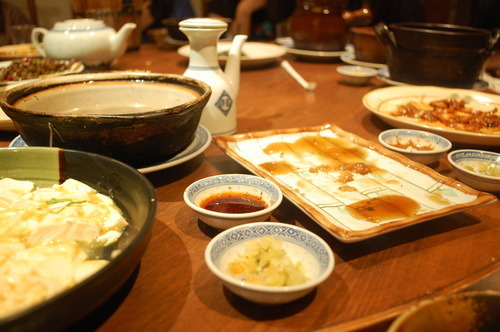 i ate it without asking because so far the other dishes had been pretty standard: cauliflower, shumai, noodles, etc. only later in the meal did they ask if i had ever eaten the bird meat before and whether american people ate it. the entire time, i thought it had been quail so i said “sure, american people eat it but not very frequently” they sounded surprised so then when i inquired more, i realized that they were talking about pigeons and NOT quails. 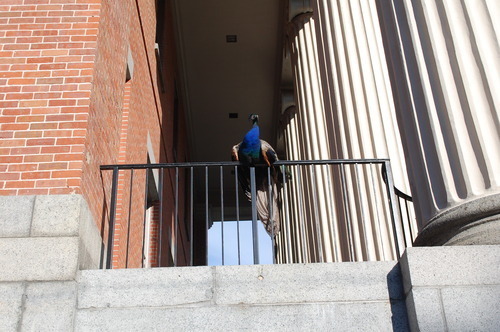 sorry pigeons for eating you. and then this morning after breakfast, my grandma gave me a popsicle. tiramisu ice cream covered in chocolate for breakfast? YES PLEASE. life in china is good…one afternoon left in shanghai before going to beijing for hsylc! my flight from toronto to shanghai was delayed for five hours so i have been sitting at my gate in this airport for almost 6 hours already. i was able to wander around the area that surrounds my gate but not much outside of that. i’ve heard this is one of the biggest airports in canada but there weren’t really many places to go. there were a bunch of places with a glass door/gate where i could SEE the other side aka a long hallway with something to keep me occupied but THERE WAS NO WAY TO GET THROUGH. it was bizzarre. i don’t know why they blocked off some gates from others but it basically confined me to this little space. between coming back from new york and heading off to china, i only had five days to hang out at home! it’s nice to be home but i’ve also realized that i don’t know how much longer i’ll actually be living here. crazy. five days isn’t a lot of time to spend at home but i tried to fit in as much as i could while i was here! met up with my harvard china care mentees the second night i was home to catch up with them and see how they were doing. i always love seeing them and our conversation centered a lot on justin bieber and one direction. they claimed to both be “one direction-ers” but not “beliebers”. although my mentee knew all of the lyrics to “boyfriend.” super impressive. spent one night at harvard that included a lovely dinner with boston oaasis sisters, fro yo with some cool cabot peeps, late night chat while eating georgetown cupcakes, and ending with breakfast at zoe’s. it was nice to see everybody and crazy to think that i’ll be back in a month for my junior year! spent the next couple of day catching up with my best friend from high school as we ate and sat down at three different places in chinatown. always nice to be back in boston chinatown for bubble tea, viet subs and pork buns. (: yum yum. and then today, met up with my first best friend that i had met in kindergarten (crazy to think that we have been friends for almost 16 years now!!). we went to park to swing on some swings but got too hot so went to our favorite jp licks for ice cream! and then ended up wandering around the sanctuary behind our elementary school where we always used to go to play “capture the flag” and “sardines.” had dinner with a family friend who my parents met over 20 years ago and have known me pretty much since i was a baby. it’s incredible how quickly time flies by! only eight hours until i’m on a fight heading for china! just as i was about to go to sleep and put in my contacts, ONE OF THEM CRACKED IN HALF. I AM SO ANNOYED. but, thankfully i have my glasses so it looks like i’ll be wearing my glasses for the next two weeks until i return back to boston! i am really going to miss this city. 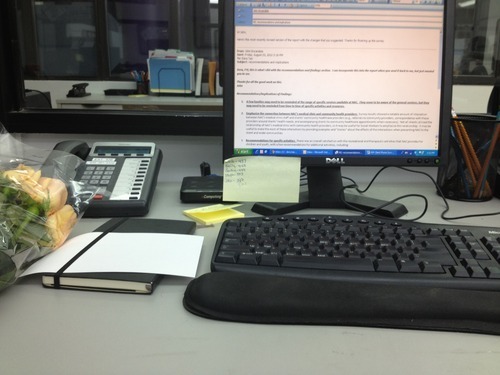 when school first got out, the idea of doing a ten week internship seemed ridiculous. ten week seemed like an extremely long time to be in new york for the summer- i would be spending the entirety of june and july here. but looking back now, i can’t believe the summer passed by so quickly. as my supervisor said to me yesterday, “time goes by a lot faster as you get older.” but i’ve definitely had an amazing time here- from working at a an organization i have grown to love to eating my way through the top rated places on yelp to visiting places i’ve never been before. had dinner last night with another senior who had just graduated at st.mark’s place before calling it a night with a late-night trip to max brenner with friends who were visiting from boston. 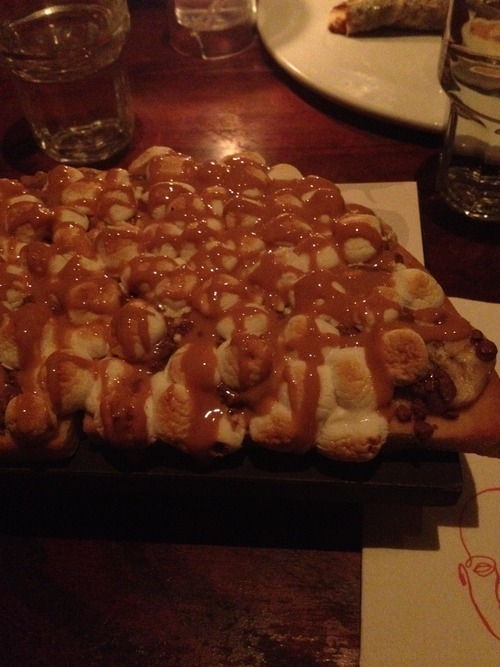 i have been wanting to try their dessert chocolate pizza ever since i discovered this place and finally got to try it! i shared a “the works” pizza (peanut butter, marshmallows, hazelnut bits, bananas) with a friend to end an awesome summer here in the city. who knows when i’ll be back to nyc to actually live long term (or if i even ever will!) but i’m glad to have been able to spend my summer here and experience all that new york has to offer! plans for the last month of summer: home, china, san francisco then back to school! here’s to one more month left! can’t wait to be back here for more in the future! all i do is eat (and walk). only five more days left here! the summer has flown by. it’s incredible how quickly ten weeks can go by. my work is starting to wrap up as i finish my projects and in just a few days, i’ll be driving back to boston. after work on friday, met up with my roommate at the museum of moving image for their free friday afternoon admissions! it was pretty cool with a bunch of exhibits about the history of film and everything that goes into making one (set, costumes, producers, sound, etc.) spent the night watching the OLYMPIC OPENING CEREMONY. yes, i did sit through the entire four-hour ceremony because the olympics are just THAT AWESOME. saturday, we decided to go back to brooklyn for one more day of adventuring! 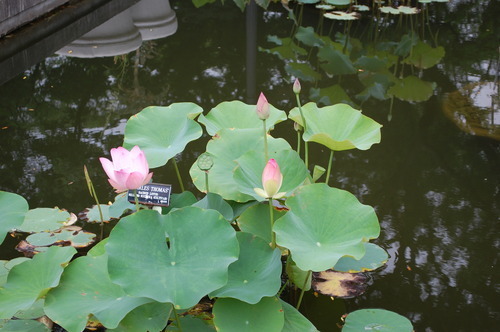 started at the brooklyn botanic garden which was absolutely gorgeous! so many plants and pretty flowers. it was also really cool that there were a bunch of “controlled environments” that housed desserts, tropical plants and others. favorite parts were definitely the bonsai exhibit (they are so cute!!!) and rose garden. 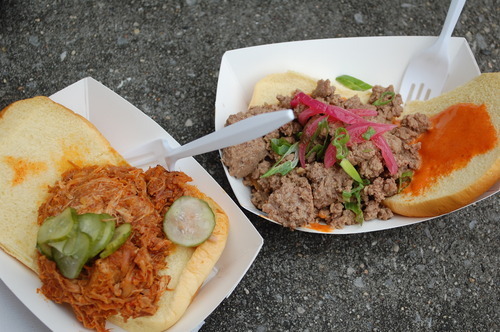 (: made our way afterwards to the fort greene flea market where we wandered for a bit and got korean-inspired sloppy joes/pulled pork sandwiches from the good fork vendor which were delicious! after deeming the flea market too expensive to actually purchase anything (although fun to look at all the vintage stuff), we went to ample hills creamery for some delicious ice cream! they are most famous for their salted crack caramel but i opted to get the munchies flavor instead. 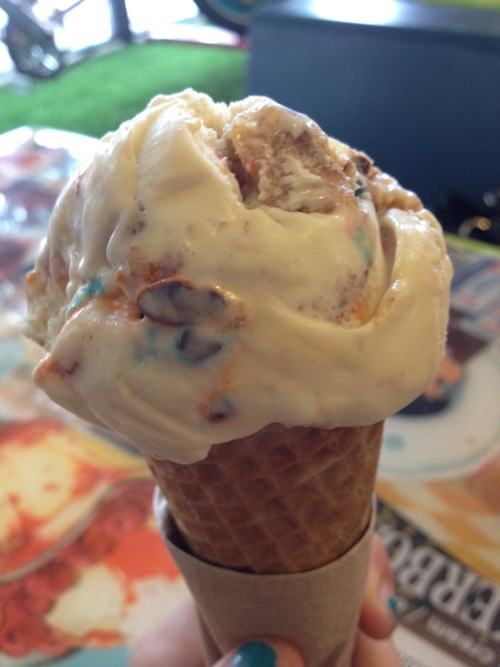 clusters of crackers, pretzels, chips and m&ms in pretzel-infused ice cream. so good! and the store was really cute inside! and before coming back, picked up a chocolate macadamia nut cookie from joyce bakeshop for dessert later. we were both SO LOOKING FORWARD to dinner because of plans to eat pizza from artichoke! we had passed by the pizza store multiple times and we were always either not hungry or the line was really line so we decided to finally get some for dinner. their slices were huge but SO GOOD. 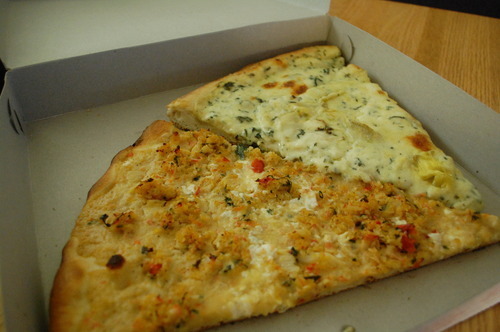 the two of us split a slice of their classic artichoke and crab pizza. i like the artichoke one better! it didn’t have any tomato sauce and was more alfredo-y but yum yum. also picked up some chive and pork dumplings from vanessa’s dumplings to eat as an appetizer for the pizza. (: and if this isn’t the time to YOLO for food, i don’t know when it would be. 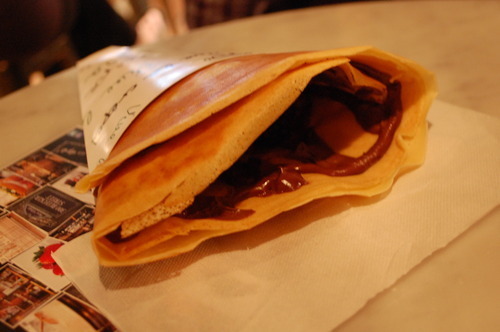 and partly only because we had a deal from scoutmob, we casually wandered over to vive la crepe for some delicious sweet crepes for dessert- strawberry with nutella. the perfect end to a great day. 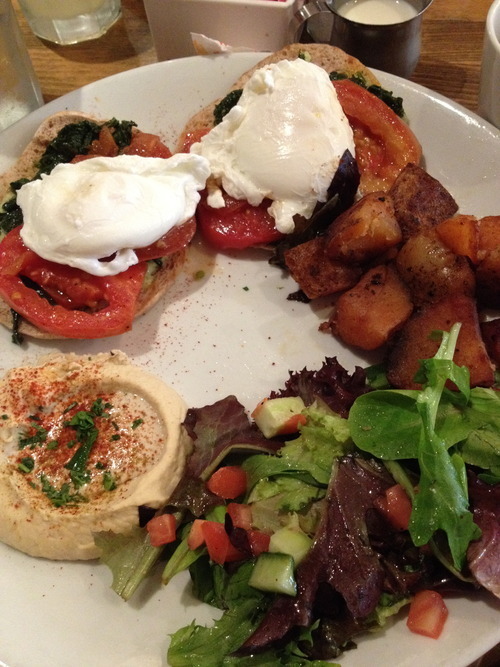 started sunday with brunch at hummus place in the upper west side! ordered the florentine eggs which was spinach, roasted tomato, pesto and poached eggs on an english muffin with a side of hummus/salad/roasted potatoes. one of the better brunch places i’ve had and a really great price as well! 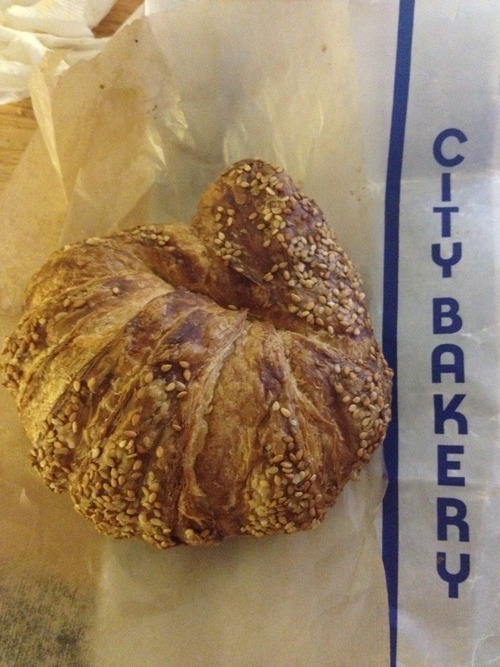 and conveniently, it was right next to levain bakery which i have been wanting to try all summer! 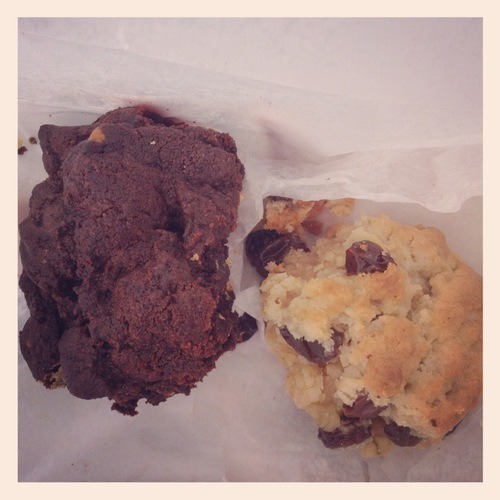 known for their HUMONGOUS cookies, i was not at all disappointed when my friend and i got a dark chocolate peanut butter chip cookie and oatmeal raisin cookie to split. each weighed about 2 lbs and probably had tons of sugar but WHATEVER. they were delicious. 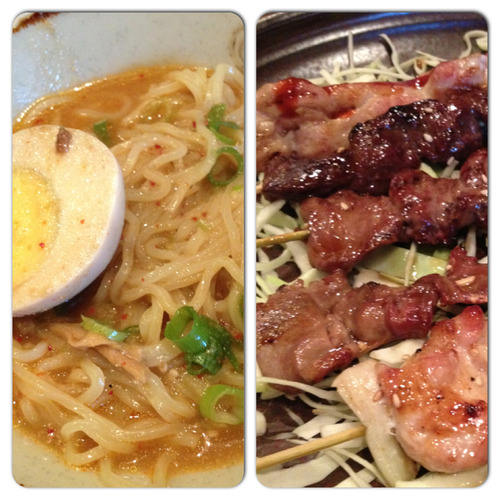 after visiting more of the campus and visiting some buildings/classrooms, had dinner back in east village at east noodle where i was actually able to tolerate the spicy ramen and yakitori we ordered. yay for (hopefully) more spicy-tolerant tastebuds! !